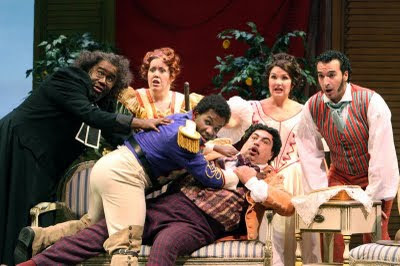 The choice of Rossini's overexposed opera buffa The Barber of Seville to open the Washington National Opera season left me underwhelmed. After seeing the second performance last night, however, I am happy to reverse my decision not to recommend this production, because in spite of the many deficits a company faces in making new something that is so familiar and even tired, it is definitely worth a hearing. True, David Gately's production hardly qualifies as original, with pretty enough sets (Allen Moyer) and costumes (James Scott), somewhat updated from the 1995 premiere and 2001 revival, placing the action in the late 18th or early 19th century, but it is a mostly pleasing if very traditional evening. Gately's forte is the acting direction, and he makes every character's gestures and movement make sense with the details of the storyline. Sometimes he takes this attention to detail to a fault, exaggerating the "freeze frame" effects of the Rossinian finale, for example, with a slow-motion farce at the end of the first act, way over the top. He also makes Figaro, the fast-talking factotum who takes more credit for the opera's happy outcome than is really due him, into an actual all-powerful puppet master, a stand-in for the director himself, literally staging many of the scenes, posing the characters and putting props into their hands. The opera is, it's true, mildly amusing but the sense of forced hilarity, the kind that makes one's smiling muscles hurt from over-exertion, at times rang false. No, the main reason to see this production is the chance to hear the opera in something resembling its original form, that is, with Count Almaviva's demanding Act II aria Cessa di più resistere restored. As described by Richard Osborne in his Rossini biography, the opera's premiere, in 1816 at Rome's Teatro Argentina, was a notorious fiasco, in terms of stage accidents and lack of singer preparation. At many subsequent performances, and most modern ones, directors and conductors cut this aria. Rossini himself approved of the excision but, unwilling to let the music be wasted, reworked the aria twice, most famously as "Non più mesta," the tour de force that concludes La Cenerentola and also as "Ah, non potrian resistere" in Le nozze di Teti e di Peleo. The effect of the restoration of this aria, especially as sung so magnificently by Lawrence Brownlee on Monday night, is to remind the listener of why Rossini originally presented the opera under the title Almaviva, ossia L'inutile precauzione. It makes Almaviva the star of the show, and indeed he received the loudest ovations. Brownlee, who has demonstrated his mastery of the bel canto repertoire on several previous occasions, took a few minutes to warm into his voice, but eventually he sang with a smooth tone and athletic agility. It is not a large instrument, the placement a little nasal and mixed with a lot of head voice, but the high notes were bell-like and reached easily to our seats at the front of the box tier. The rest of the cast was certainly fine, beginning first and foremost with the robust voice of Eric Owens as a kleptomaniacal Don Basilio. As Rosina, Spanish mezzo-soprano Silvia Tro Santafé had a durable, leathery sound, her wide vibrato troublesome only in a few spots that required smoother legato singing. In terms of the clarity of her runs and other passage work, she was a good match for Brownlee. Italian baritone Simone Alberghini was a charming, funny Figaro, with some potent high notes but a tendency to muck up the more demanding melismatic passages. The appeal of Donata DiStefano's Doctor Bartolo was more comedic than vocal, as he slurred and mugged his way through a role that fortunately does not require that much beautiful singing. The other musical star of the evening was young conductor Michele Mariotti, in his first appearance with Washington National Opera. The talented Italian has Rossini credentials, going back to his studies at the Conservatorio Rossini in Pesaro, and indeed made his opera conducting debut with Barber in 2005. He had an elegant, patrician presence on the podium, conducting with clear, smooth gestures that instantly righted the many passages in this opera where orchestra or singers tend to rush and get off from one another. The WNO orchestra has rarely sounded this unified and rhythmically tight -- and in good intonation (except for a few spots early in the overture) and balance -- in recent memory. Five more performances of The Barber of Seville remain, from this evening through Sunday (September 15 to 20, various times). There are tickets available for all performances. "Ella era uno nove, cioè uno miracolo"